Greetings from New York! 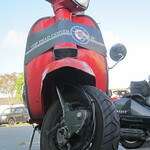 So my Rally 200 is still being a diva Ironically, the Lambretta DL150 is running great. - Replaced SI24/24 carb (new) with flatt throttle plate (put the new cutaway plate aside as they are supposed to be harder to set correctly), 122 jetting (118 would be stock), extended too small fuel hole in chamber for faster flow (1.5mm to 2.5mm). Otherwise she is all stock with 6V Femsa-replacement ignition. Plugs look fine, slightly on the rich side. Has anybody an idea what could cause her temper? Timing that is set statically too far retarded shall never allow the kit to run at full potential. Can you check it and make sure it is set right..? If engine is too lean the exhaust note goes a bit dull and hollow sounding. Not good. If main jet is too rich you get missing, smoke and oil out exhaust, fouling plugs and a sort of hesitation while going full speed.